Now on sale at seriously ridiculous prices at One Fat Frog Restaurant Equipment are their entire stock of used tabletop charbroilers. 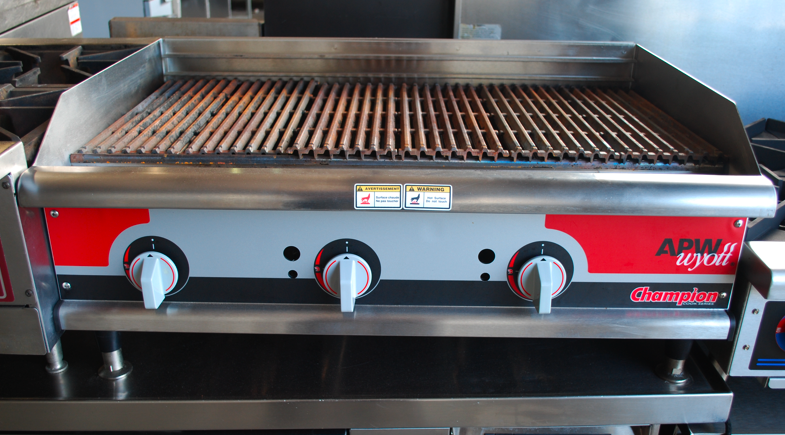 One Fat Frog Restaurant Equipment carries several different brands of charbroiler including Vulcan, APW Wyott, and Wolf. Various sizes from 24″ to 36″ charbroiler. Charbroilers are perfect for cooking a selection of food including seafoods, burgers, steaks, etc. To ensure your used charbroiler has a long service life, here are some maintenance tips. Exhaust requirements are highly important for charbroilers. Water and grease pans need to be emptied at least daily on charbroilers. Radiants should be brushed off daily to remove any food debris. Ceramic briquettes need to be flipped regularly so the heat can clean them. Burners on a charbroiler should be inspected for proper combustion. A gas-service technician should be called in to adjust air shutters on burners. If food debris and materials build up on the unit, this will shorten the charbroiler’s service life and pose a potential fire hazard. One Fat Frog Restaurant Equipment can get you financed for all of the used commercial restaurant equipment you need 0 including used charbroilers! One Fat Frog Restaurant Equipment also welcomes quick cash deals and package deals towards the entire stock of used commercial restaurant equipment – including used charbroilers. Come and check out the selection of used charbroilers today! ← Free Restaurant Equipment Delivery to St. Augustine, Jacksonville, Gainesville, & More!